A fresh vibrant and natural approach to weddings, family portraits and glamour photography. The Dreamcoat Photography Production Team work with you to create naturally posed photos of you and your family that reflect your personality, style and natural enjoyment of life. They say never work with children and animals - why not? We love them and are happy to include your pets and your children into the photos and work with you to create lasting memories of fun times. We also love to cover your corporate events and activities, products and real estate. Great portraits, Realistic Prices. We believe you should be able to get great photos for whatever your need, family portraits, profile pics, cosplay pics or glamour photography for great prices. Our commercial services include real estate, business packages, corporate events and conferences. Real Estate companies – we would love to work with you. We also work with private sellers to showcase their property. Your Event is Awesome – We Prove It! We ensure that all the photography aspects of your event are covered. Fantastic live action shots of you on stage, or studio and location shots for album artwork and social media. Staff photos and unique stock photos for your business for web and social media. Regular package plus extra photos, white box product shots and advertising templates. Many of our clients are design and media agencies who contract us to source images for their clients. Tim Miller at Dreamcoat Photography provided a creative, fun, professional photo shoot with some amazing results and blew away all expectations I had. These days, anyone with a camera calls themselves a photographer but its the years of experience dealing with every situation possible that makes a true artist. I had some very specific requirements for my photo shoot that Tim absolutely nailed, as well as bringing many of his own amazing ideas to the table. The turnaround on finished photos was super fast - I was looking at some early proofs on my phone before I had even arrived home from the photoshoot!! Amazing results and I wouldn't hesitate to recommend Dreamcoat Photography to anyone looking for studio or location based photos. Tim is your man. Redsell Air has used Dreamcoat Photography for professional corporate photography for our website. We found the whole experience of dealing with Tim from Dreamcoat extremely professional, right from the initial consultation through to the receiving of prints. Tony and I have also used Dreamcoat for personal family photos of which we love as they were exactly what we were wanting. 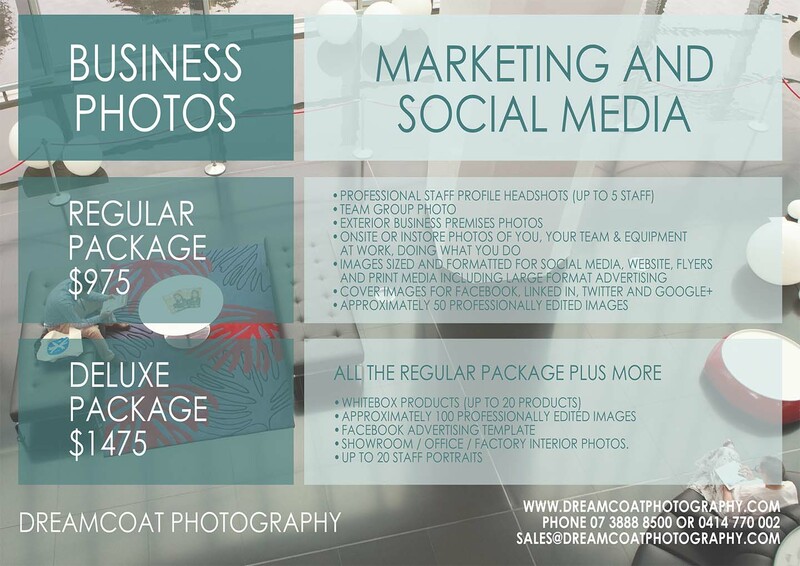 We both personally and professionally thoroughly recommend Dreamcoat Photography.